We're honored to feature poems by Bradley Samore in Issue One of Orson's Review. We're also very fortunate for the time Bradley took to sit down and chat with us about his journey as a poet. 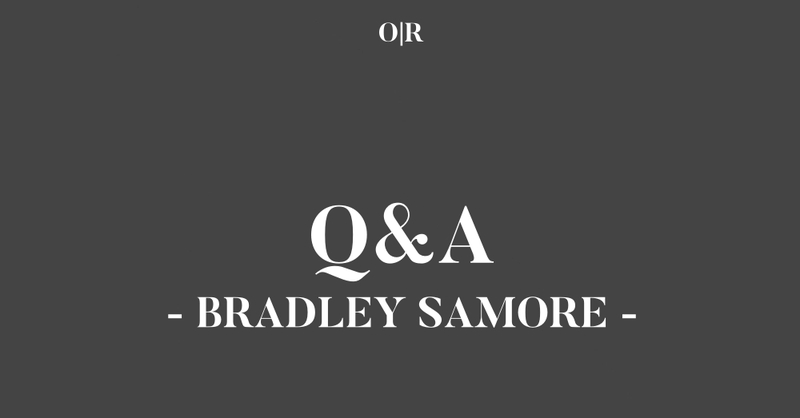 *The following interview involves Orson's Publishing (OP) and Bradley Samore (BS). BS: Way, way back probably with my mom, an English teacher, making me write journal entries when I was four. Specifically with poetry, I took a British Literature course in college and really enjoyed Wordsworth’s passion, how earnest he was. Then, a science fiction course in my senior year was one of the few things I could look forward to during a difficult time. Before I left for Spain to be a teacher in a small, rural town, I read a book my Dad had – “Good Poems” by Garrison Keillor. In it was Wendell Berry’s “The Peace of Wild Things”, which moved me more deeply than any other writing had up until that moment. The next step was to start writing bad love poems and have that woman reject my impassioned advances. BS: No, I am a high school English and creative writing teacher. OP: What about these three poems are you most proud? BS: With “Communion”, I like that I was able to capture some of the feelings and sense of awe my friend and I felt on a special walk. We had stumbled upon an abandoned trail that was being taken back by the earth. With “Candle Smoke”, I wanted to honor close friendships and those who help us through difficult times. I feel that the presence of some of my friends has stayed with me. These thoughts sometimes come quietly deep in the night, in solitude. I think the flame, always changing, has captured my sight when I’ve sat around it. This sort of mesmerizing trance relates to reflection for me sometimes. In “Con Mi Padre”, I think I was able to capture a moment of serendipity while in Spain. I enjoy the idea of strangers meeting and connecting deeply. BS: I used to approach all pieces roughly the same way. An idea comes to me and, before I forget it, I’ll write down (typically in bullet points) as many ideas as I can think of. However, lately the ideas have been coming down as verse. I’ll hear the idea in the form of poetry. Sometimes it will just be a line and the others may not come for months or maybe ever. BS: I vaguely remember wanting to be a botanist, maybe because I enjoyed plants. Other than that, I wanted to be a basketball player or jazz trumpeter. In both of those, I would pour my soul into each. People would tell me, “Don’t try so hard.” A girl once told me back in college, “You’re too genuine.” In poetry, much of my early stuff was a pouring. Now I pour and let it sit and distill. With my eagerness, it can be difficult to wait, but two quotes come to mind. Ted Kooser said something like, “No one’s waiting eagerly for your poem to come out, so you might as well wait and make it good.” And Oscar Wilde said, “All bad poetry is sincere.” I can be pretty sincere. BS: Staying up way too late, wringing every last drop of a poem out, then feeling the effects the next morning at work. BS: Perhaps 10 in full. I am usually reading snippets of 4 or 5 at a time. BS: The best one I’ve attended is the one I still do – the second Thursday poetry readings at Flyleaf Books in Chapel Hill, NC. The writers are high quality and quite friendly. BS: Ears, poems, hugs, and good humor. BS: I recently have been considering pursuing an MFA. Still, I don’t think it’s crucial. Homer? Wordsworth? Dante? MFA? BS: A chance to sit down and write (or read or edit). BS: How could I know? In the meantime, I’m going to write and read and write and read (among doing other things). I will keep trying to give my work an audience and delve into new ground. Be sure to check out Bradley's poems in Issue One of Orson's Review.